The Queen, who converted to Catholicism and abdicated the throne, is shown in a gilt and bronze medallion, supported by a crowned skull. 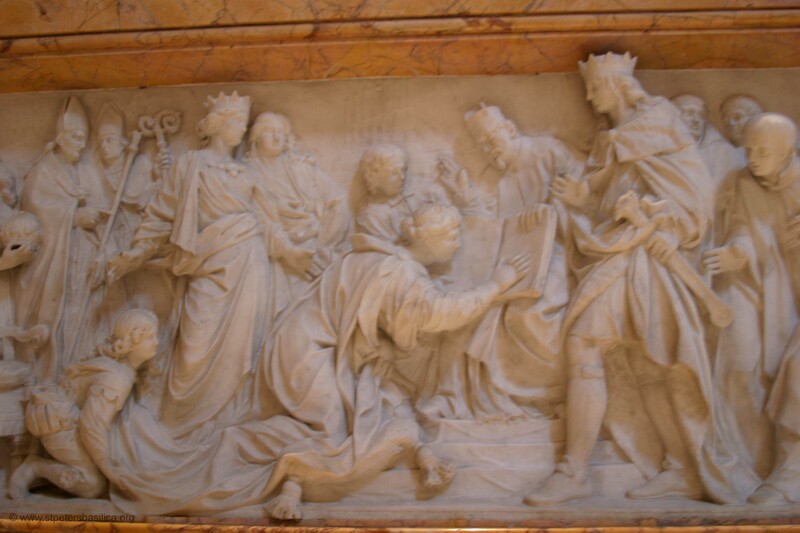 There are three reliefs on the urn: Christina relinquishes the throne of Sweden to embrace Catholicism (center), the scorn of the nobility (on the right), faith which triumphs over heresy (on the left). The brave Swedish queen who relinquished the throne in order to embrace Catholicism. (The abdication document is in the Vatican Archives.) After enduring the scorn of Swedish nobility, she left her homeland and settled in Rome until her death. Note the magnificent, crowned skull - showing the fleeting life that we lead, and the crown that awaits us if we are true to the faith. 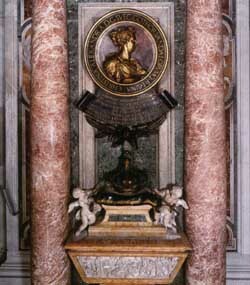 In front is the Monument to Christina of Sweden, ordered by Innocent XII but finished under Clement XI in 1702. It was designed by Carlo Fontana; the bronze medallion with the harsh profile of the eccentric queen is by Gilardoni; the putti are by Ottoni; the bas-relief, depicting the abjuration of Christina, which took place in Innsbruck in 1655, is by Théodon. The pope (Innocent XII) wanted a memorial in St Peter's to Queen Christina of Sweden, in whose conversion he vainly foresaw a return of her country to the Faith and to whose contribution towards the culture of the city he looked back with gratitude. Fontana designed for the first pier of the right aisle a sepulchral memorial of unwonted importance for a royal personage. 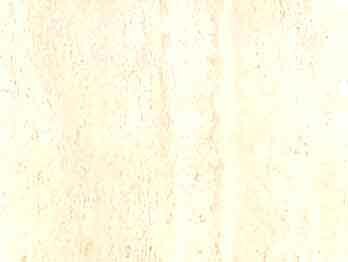 A white marble bas-relief shows the queen abjuring Protestantism at Innsbruck in 1655. 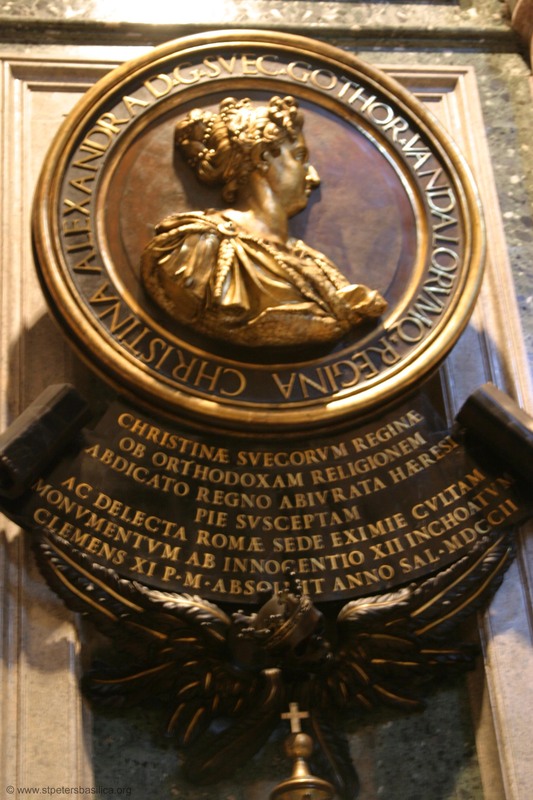 Overhead, a large medallion frames a portrait of Christina in silhouette. It is an unromantic likeness, for she is given a double chin and a prominent nose with flaring nostrils. Both bas-relief and medallion were executed by G. B. Theodore, a French sculptor of talent whose last days were spent carving religious statues for the Palace of Versailles. Perhaps best known as the indirect cause of death of Rene Descartes, Princess Christina of Sweden was a student of the master philosopher. Descartes died from a cold caught after grueling, infamous 5 a.m. philosophy sessions with Cartesian Christina, in the cold of her Swedish castle. She is well-known as the provocateur of Descartes' "Letter on Love." This was the beginning of a number of letters that passed between the two, which influenced Christina to eventually call Descartes to her home in Sweden in order for him to better tutor her in the Cartesian methods of philosophy. Descartes succumbed to Stockholm's cold in a mere five months. A well educated and intelligent monarch, she converted to Catholicism soon after Descares' death, and after abdicating the throne in 1654 she moved to Rome. It was from Innsbruck that the European Courts were officially informed of her change of faith. On 23 December, she reached the capital of Christendom, which was decorated in her honour. The pope came personally to meet her, administered the sacrament of Confirmation, and added Alexandra to her name. At Rome, Christina's home was in the Palazzo Farnese; during her residence here she sought to satisfy her intellectual ambitions as well as the longings of her devout and loving heart. She visited the sacred places to pray, went as a ministering angel into the hovels of the poor, and devoted herself to the study of the collections of art and the libraries. She drew into the circle of her fascinations the leading families of the Eternal City, arranged concerts and plays, and knew how to delight everyone by her acuteness and learning. She was not willing, however, to drop rough Swedish customs, and allowed herself to display various peculiarities of dress and manner, so that many people avoided her. Unconcerned with appearances, and daring to live a life of almost total freedom, Christina was one of the most highly independent, unconventional, and outrageously colorful women in history. The Greta Garbo film, Queen Christina, is a highly fictionalized portrait of her last years as queen. 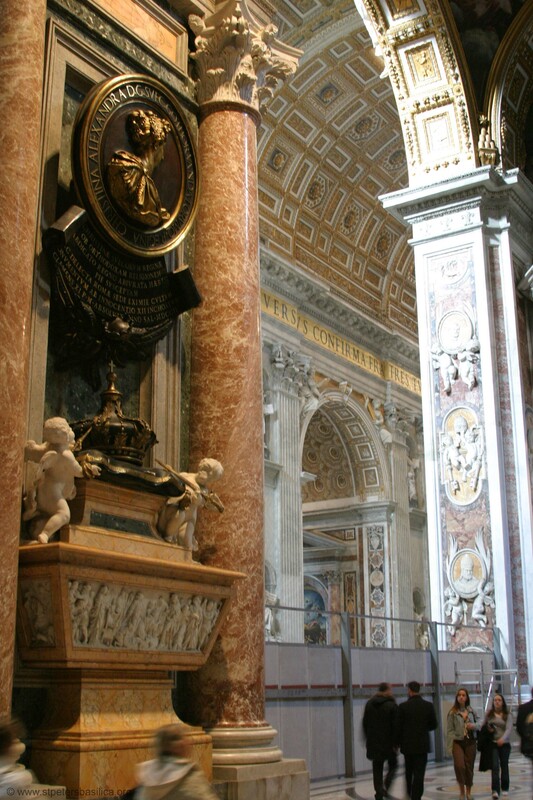 Against her express wishes the pope had her body embalmed and brought to St. Peter's where it was buried under the high altar. Her ostentatious but not prepossessing monument is the work of Carlo Fontana.